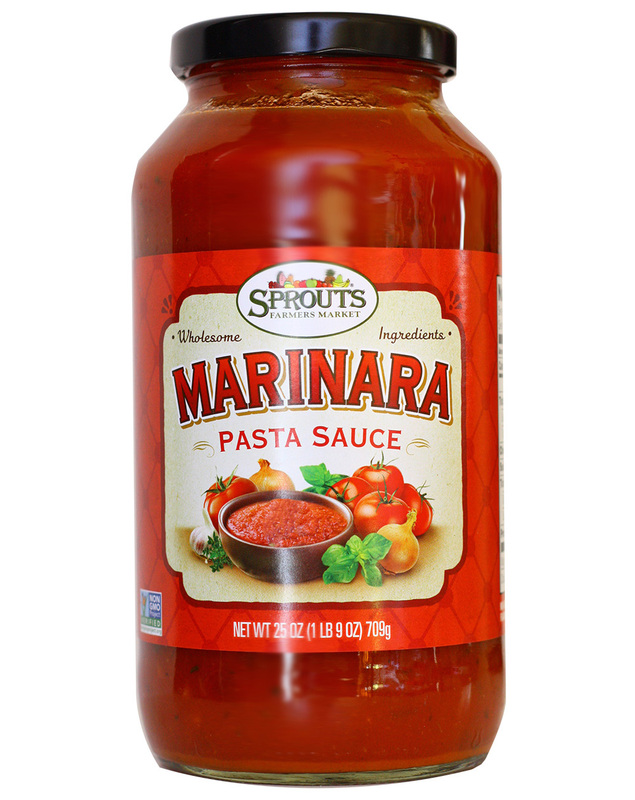 Like that date with the not-so-good-looking guy that surprisingly wins you over with his intellect, charm and just-can’t-put-your-finger-on-it appeal, my first taste of Sprouts Organic Marinara left me thinking “what just happened? !” Best spaghetti sauce, ever! For this photo I inadvertently grabbed a bottle of Sprouts non-organic marinara. Skip this one and go for “organic.” The price difference, if any, isn’t much. We met in a grocery aisle, my favorite spaghetti sauce and I. I had given up on the prospect of finding one that I truly loved. My hopes of finding a marinara that was full-flavored, complex, not too hung up on himself and an adventure with every twirl of my fork had faded. I had resorted to settling for the cheapest bottle on the shelf. Italian night in my home had grown dismal. Then one day I had a little extra time to mosey the aisles of our local Sprouts Farmers Market. A sale tag under the Sprouts store brand of marinara caught my eye. Looking under the hood I saw that it contained less sugar than Bertolli’s and Prego (and just a tad more than Muir Glen)—not bad, I thought. Still, I prepared myself for another let down and hesitantly placed it into the cart. So in the event you’ve been seeking a new pasta sauce romance, I suggest you head on down to Sprouts. This bottle of tomato goodness is great tasting, competitively priced, organic and the best spaghetti sauce ever. It’s most definitely worth a try.